Every woman wishes to have perfectly shaped breasts, but not all women have that blessing. The sagging breasts are a normal process that happens with age because the skin loses its elasticity. Other factors that can affect the shape of the breasts are pregnancy, overweight, smoking etc. Chest Press. For this exercise you only need two dumbbells and nothing more. Lie flat on your back and take a dumbbell in each hand. Extend your arms up and hold them like that for 10 seconds. By doing this exercise, you will add firmness to your breasts. Arm raise. In order to activate your chest muscles simply do an arm raise exercise. Place your feet apart and reach straight up. For this exercise you should lie down on your stomach on the floor. Then push your body up with your arms and keep it your back straight. By placing the whole weight of your body to your arms you help the chest muscles to strengthen. The structure of the olive oil improves the form of the sagging breasts. This is because of olive oil’s antioxidants that can reverse the damage caused by free radicals. What you only need to do is massage your breasts with olive oil for 15 minutes, few times a week. The posture of the body has a great impact on the appearance of your chest. According to Organic Facts, the hunched shoulders do not give support to your breast but contrary damage their shape. 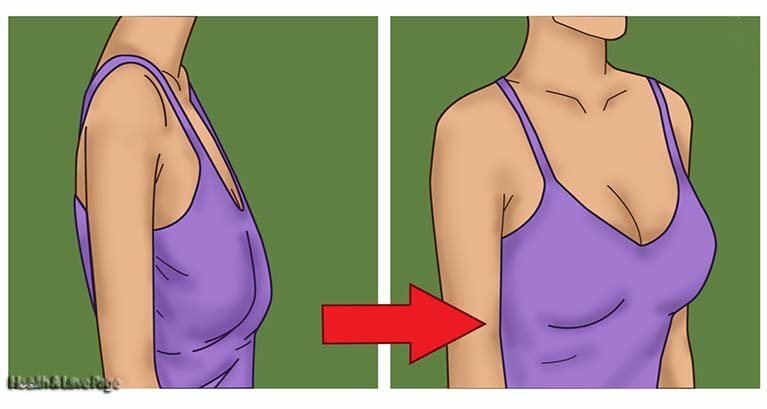 So, stand up straight and push your shoulders back in order to prevent sagging breasts. The Search Home remedy points out that ice can firm and tone the breast skin. It is so easy, take a cube of ice and rub your breasts in circular motions. Massage for about 1 minute but no more because longer exposure to ice can cause numbness. Because of its astringent and skin-nourishing properties, egg white is good for the sagging breasts. Also the hydro-lipids help in lifting the loose skin. Beat one egg until you get a foamy texture and then apply it on your breasts and let it for about 30 minutes before you wash away. Aloe Vera has a vast number of usages because of its healthy and healing properties. In terms of sagging breasts, Aloe Vera can improve blood circulation and strengthen the connective tissues. Apply Aloe Vera gel on your breast and massage them for 15 minutes in an upward motion. Most of the essential oils such as lemongrass, cypress, carrot and spearmint can tighten, tone and lift the sagging skin. Organic Facts suggest a casual use of essential oils because sometimes they can cause a burning sensation. Cucumber helps in firming the skin and natural lifting of the breasts. So grind a cucumber and add some butter, natural cream and an egg yolk to the combination. Cool the combination overnight and then apply it to your breasts.